What's the Next Stage in the evolution of________? Cecilia Abadie - A passionate evangelizer about everything digital, Cecilia Abadie is a Google Glass Explorer and Pioneer who spreads the word about wearable devices and the many ways they can change our world. As one of the founders of Byte An Atom Research, she is part of a global development team that researches and develops wearable and mobile applications to deliver experiences that innovate and disrupt the personal and the enterprise realms. Cecilia was born in Argentina and raised in Uruguay, which is where she got her Master’s Degree in Information Systems and where she began her career as an international software consultant and developer. She immigrated to the United States of America ten years ago and is currently living in Southern California. Jan Smith - Jan M. Smith, Founder and President of Inland Management Group, provides organizations and individual clients with invaluable outsourced Human Resource professional advice in the areas of Human Resource Management, Hospitality Operations, Training & Development, Employee Relations, and Recruitment. An energetic facilitator, speaker, and trainer for national and international corporate and non-profit organizations, Jan has shared her passion for service excellence through her support of the Tourism/Hospitality/Service industries in Temecula for the past 15 years. She is on the Board of Directors for the Temecula Valley Convention and Visitors Bureau. Her non-profit initiative, Begin Again Career Transition Services (BACTS) program, has provided outplacement/career transition services to hundreds of local unemployed residents of the Inland Empire. Lexi Provost - Lexi Provost is a senior at Great Oak High School in Temecula, where she serves as Student Body President. Active in her high school and community, Lexi is a member of the Great Oak spirit committee club, rallies club, special needs assistance club, and Students against Destructive Decisions club. Lexi works part time at Little Sprouts therapy as a therapist’s assistant and receptionist. In addition, she tutors Algebra and Geometry. Guy Reams - Guy Reams has lived in the Temecula Valley area since 1997. A Professor of Computer Information Systems at Mt. San Jacinto College, he teaches courses in Systems Analysis and Design and Networking. In 2003 Guy started a systems integration company in Temecula specializing in Education, Government, and Medical verticals. He has served as a consultant and engineer in data center design and enterprise storage projects for large corporations. Recently he has built a technical lab in Temecula and is developing an online education program for the customers of Ingram Micro (IM NYSE). In the community, Guy is involved in economic and workforce development initiatives on various committees and serves as a board member of the Workforce Investment Board. Guy also owns the non-profit organization Temecula Chess Club, which provides opportunities for the youth of the area to win with their minds. Guy Romero - Guy Romero is Assistant Superintendent of the Murrieta Valley Unified School District. During his 36 years working in education Mr. Romero has held a variety of positions, from teaching at secondary and elementary levels in grades K through 9, to principal at both elementary and secondary levels, to positions at the district level. For the last 11 years Mr. Romero has also taught courses at Chapman University and the University of California, Riverside. He earned his B.A. from California State University at San Diego and an M.A. from California State University at Fullerton. Kyle Napalan - Kyle Napalan is CEO and Founder of The Dial Collective in Murrieta. The Dial is a community of musicians, artists, all types of creative people really trying to impact the world; even if it’s just on the local level, even if it’s the tiny bit of our own backyards. There is no better time to come together and create, whatever medium you choose and whoever your audience is; just strive for the genuine, be open to change, not afraid to leave your mark. That’s what we’re looking to do. Celeste Cantú - Celeste Cantú is General Manager for the Santa Ana Watershed Project Authority (SAWPA). SAWPA is located in Riverside, approximately in the geographic center of the watershed. The watershed, and the State as a whole, face many challenges in ensuring that there is sufficient, high-quality water for the ever-growing population of the region. SAWPA works with planners, water experts, design and construction engineers, and other government agencies to identify water issues and solutions for the region. Celeste previously served as the Executive Director for the California State Water Resources Control Board, which is responsible for water rights and water quality for the State. During the Clinton Administration, she served as the USDA Rural Development State Director for California. Born to a pioneer family and raised in the Imperial Valley, Celeste first served as Planning Director for her hometown, Calexico, and later as Executive Director for the Imperial Valley Housing Authority. Celeste has a B.A. from Yale in Urban Planning and Policy and a Masters in Public Administration from Harvard’s Kennedy School of Government. She currently lives in Temecula with her husband, Dr. Barry Stampfl, an English Professor at SDSU, Imperial Valley Campus. Wes Schaeffer - Wes Schaeffer is an author, speaker, consultant, and owner of The Sales Whisperer®. He has built his sales training and marketing firm to be the #1 reseller of Infusionsoft in the world with no paid advertising, no sales staff, and no full time employees. A graduate of both the United States Air Force Academy and Texas A&M, Wes says he is bi-lingual in “Geek” and “Bubba,” but hailing from the South, he prefers Bubba. A resident of the Temecula Valley since 2004, Wes personifies his motto of “Life’s too short for follow-up calls” by mastering the delicate balance of technology with a personal touch. He launched The Sales Whisperer® in 2006 to help professional salespeople, sales managers, business owners, and entrepreneurs sell more, faster, at higher margin with less stress and more fun—and he has been known to work for brisket & Scotch. Vanessa Sheldon - It was during Vanessa Sheldon’s first harp lesson, at the age of nine, that she discovered her life’s vocation, a career in harp performance and education. 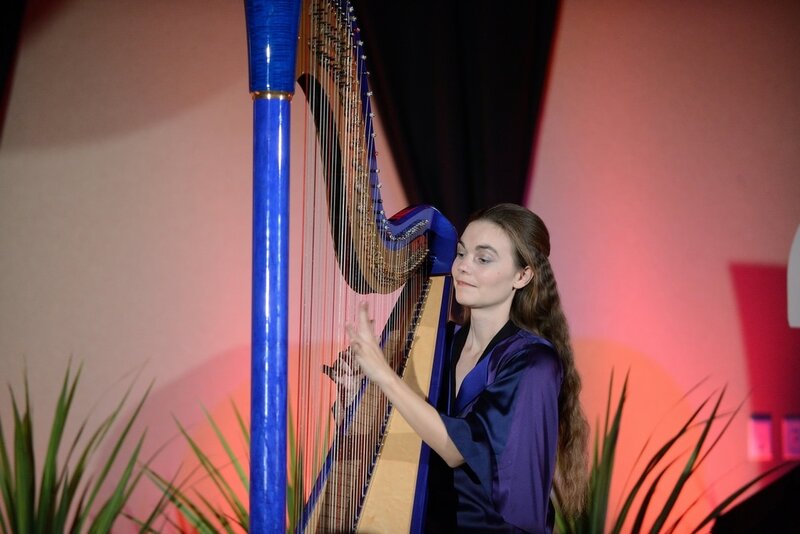 A native Southern Californian, she holds a Bachelor’s and Master’s of Music from CSU Los Angeles and a Doctorate of Musical Arts in harp and musicology from the University of Arizona, where she was teaching assistant to the world-renowned HarpFusion and honored as the youngest doctoral graduate, receiving her degree at age 19. A professional pedal and Celtic harpist for over 15 years, highlights of her concert tours have included performances in China, South Korea, Spain, and the Kennedy Center in Washington, D.C. She plays for such notables as Oprah Winfrey, Maya Angelou, Tippi Hedren, and Florence Henderson, has made several television appearances, and recently concertized with Barry Manilow, John Bayless and Il Divo. Having released two solo CDs, Dr. Sheldon specializes in composing and transcribing virtuosic as well as non-traditional music for harp in addition to premiering new works for her instrument. With a solid background in Classical masterworks, Dr. Sheldon's technical skill and artistic vision allows for interpretations of a variety of music spanning Celtic, Latin, pop, jazz, and rock genres. Having earned the accolade of being the youngest college professor in the world, she accompanied her students at Norco College on an extensive concert tour of South Africa and currently teaches piano, music theory, musicology and harp at Mt. San Jacinto College, Menifee. She has been recognized for her dedication to education and harp performance through awards from the California State Assembly and the American Harp Society. A private music instructor in the Coachella Valley, Dr. Sheldon is also the founder and director of the Desert Strings Harp Ensemble and an instructor for the Osher Institute of CSU San Bernardino.